Why would anyone want to step into the cramped, dark, dingy attic or crawl space? After all, they are empty, unused and not connected to the house…so what’s the big deal if they are overlooked! Beware! You may have to pay a heavy price for this kind of attitude! The dangers lurking in these functional areas are real and continue to flourish relentlessly over the years. If ignored, they can compromise the safety, health and even the structural integrity of the property. You would surely hate to find yourself in such a dismal situation, right? Proper maintenance of attic and crawl space helps in spotting longstanding issues and tackling them promptly before they ruin your home and family. Don’t wait to take action until it’s too late. 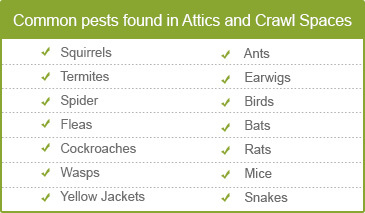 Schedule an inspection of your attic and crawl space pronto! Quartz Solutions is the one stop shop to tackle all your attic and crawl space woes! Our team of skilled professionals is committed and well-versed in the latest techniques to provide highest quality service at the most competitive rates. Left unattended the attic and crawl space presents an ideal condition for a whole series of problems to gain ground which can impact the health, safety and value of real estate. Faulty ducts and a defunct insulation impairs the temperature control system which can make your home lose hot and cool air, resulting in higher utility bills. High humidity levels and excessive wetness promotes mold, mildew and other fungi. The dangerous spores seep into the living space which can trigger allergic reactions, asthmatic symptoms, and other health problems. Structural damage is inevitable if excess moisture is leading to wood decay. Insects like fleas, spiders, wasps, roaches and termites are not only a menace but also spread infections and disease. Rats, raccoons, bats and squirrels create havoc by chewing right through vents, cables, wires, ducts, insulation, plumbing system and more. To make matters worse they leave behind a smelly unbearable waste. The first step towards the restoration process of the attic and crawl space is a meticulous evaluation of the region including testing for radon gas. Our crew at Quartz Solutions will visit your premises for scheduled inspection absolutely free of cost. The technicians will comb the area from corner to corner for any existing and impending problems. On gauging the extent of damage, a cost effective plan using the best products and latest techniques will be chalked out to rectify them. We at Quartz Solutions take the utmost pride in adhering to the highest level of professional standards and delivering the best quality service at very competitive rates. Plainfield, the township in Union County NJ close to the lush, green Watching Mountains sports eight full-fledged historic districts. The town has a wealth of unique architecture, some of which dates back two centuries. Plainfield is brimming with beautiful parks and recreational areas offering its 50,588 odd residents everything from bike trails and cricket fields to picnic areas. We are enamored by this lovely community and would love to add to its cleanliness quotient. 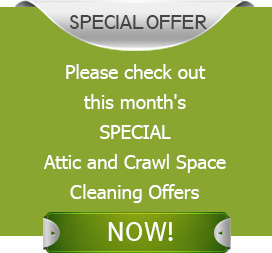 Let us help maintain of your attic and crawl spaces to keep the properties in Plainfield in premium condition. Call Quartz Solutions today at 973-536-1013 to avail a free inspection!